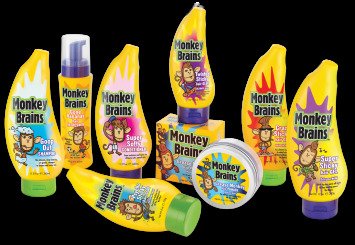 Well let me introduce you to the new brand of haircare catered toward "tweens", Monkey Brains! Monkey Brains is a new collection of hair care that allows kids to be kids. To be fun, be cool and be themselves. Kids begin to express themselves at a very young age and their hairstyle is one way of showing the world who they are. Look around... how many 8-14 year olds have spikes, fauxhawks, and controlled messiness? Almost every one you see. And then there's Justin Beiber...with the ultimate flow. With 2 Gels, 2 Glues, 1 Pomade, a Hair Refresher and a Shampoo and Conditioner offered in the new line, tweens will be able to rock whatever hairstyle they are feelin' at that moment with Monkey Brains! As a parent you will be excited to know that every product in the Monkey Brains collection contains premium ingredients, are alcohol-free and retail for around $3.99 each at stores you regularly shop at like Walgreens, Walmart, Kroger and more! And at only $3.99 a piece they are very affordable for you and even affordable on your tweens allowance (yay)! The Products: Crazy Sticky Hair Gel, Super Sticky Hair Gel, Psycho Sticky Hair Glue, Twisted Sticky Hair Glue, Grease Monkey Hair Pomade, Gone Bananas Hair Refresher, Goop Out Shampoo and Super Softy Conditioner. My Review: I have used this for myself. I love the shampoo, it really does get the oil and build up out of your hair. The conditioner works really well too, you need to use minimal amount for smooth hair. The gel is great for men to style as well. I like to put it in my hair after a shower and let it dry. After it is dry I crunch it all up so it is not so stiff and I get the beach wave look. As a hair stylist I do not usually recommend brands that are not salon quality, but this one really blew me away.